My last few blog posts have been about really healthy foods, so today I thought I'd blog about something that still has good ingredients (no high fructose corn syrup, hydrogenated oils, artificial sweeteners or sugar alcohols), but is a bit more of a splurge item (and happens to be packaged). Health is Wealth makes delicious all-natural vegetarian and vegan foods that I have savored for a long time. I blogged previously about their vegetarian buffalo chicken wings, which are a quick and yummy low calorie alternative to buffalo fried chicken (that even a meat eater would enjoy!). Health is Wealth Pizza Munchees (the subject of my post today) are also incredibly delicious and worth checking out. As someone who loves the taste of pizza crust and tomato sauce, I'm always on the lookout for low calorie pizza alternatives. 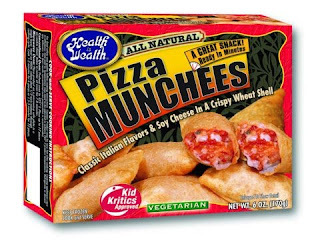 While my all-time-favorite substitute is still low calorie pizza pretzels (because I think the company that makes them has perfectly recreated pizza crust in pretzel form), I have to say that these pizza munchees come in as a close second. If you cook these pizza munchees in your oven (I've yet to try the microwave), what results is a crispy shell that is reminiscent in taste to the outside of mozzarella stick appetizers that you get at Italian restaurants. Inside is yummy pizza sauce and hot, melted, super yummy soy cheese (although they are not vegan). Amazingly, *six* of these pizza munchees (which are a bit larger than they look on the package) come in at 180 calories, with 5 grams of fat, and 2 grams of fiber (4 weight watchers points) making them a great low calorie lunch option. If you are looking to decrease the calories and eat them as a snack, you can eat five munchees for 150 calories (3 WW points), four for 120 calories (2 WW points), or two munchees for 60 calories (1 WW point). These pizza munchees are a great food to reach for during those times when you are craving something really bad (like fried, or cheese heavy), but want to fill the craving without eating a lot of calories. For me, they totally hit the spot! I buy my pizza munchees at Whole Foods in the freezer aisle.